Aquimisa Laboratorios Zamorano (LEB Silver) inked 22-year old American (has also Jamaican passport) forward Marcel Robinson (196-100kg-96, college: Tampa). He started the season at played at Bodegas Rioja Vega Logrono. 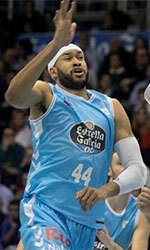 In 15 LEB Silver games in Spain he recorded 3.3ppg and 1.2rpg this season. The last season Robinson played at the University of Tampa in NCAA2 in the NCAA2 where in 26 games he averaged impressive 17.3ppg, 4.8rpg, 1.2apg and 1.3spg. He was voted to All-SSC 2nd Team in 2017. Robinson graduated from University of Tampa in 2018 and it is his first season in pro basketball.